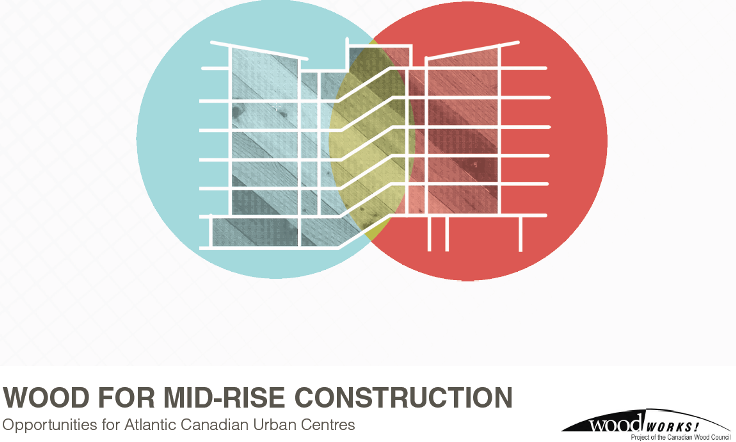 6 Storey Wood Construction Will Deliver Affordable Housing – Atlantic WoodWORKS! Halifax Regional Municipality, September, 2016 – Garden View, the first midrise project developed under ‘Reinventing Main Street,’ central Dartmouth’s new revitalization plan, will provide much needed affordable housing for seniors and families in the Halifax Regional Municipality. The 20-year plan will see the area transformed from a suburban strip mall shopping district into a dynamic, compact mixed-use community with a variety of interdependent residential and commercial developments. For project developer, Greg Fong, “the most exciting aspect of Garden View is the context in which the building is situated.” Extensive community consultation was undertaken to determine the land use for the development zone, a district of approximately one square kilometer. The resulting plan, Reinventing Main Street, is ambitious, comprehensive, and uses an innovative form-based code to direct development in the zone. A form based code offers a powerful alternative to traditional zoning regulation. The conventional zoning approach has created the congested urban sprawl that most modern cities suffer from. Conventional single use zoning regulations separate zones according to use and do not allow for the benefits to be gained from compact, walkable urbanism that encourages sustainable, higher density living. The new approach uses the urban form as the organizing principle. The physical form and character of the built environment is determined by the intentions of the community. A significant advantage to a form-based code is that plan approvals can happen very quickly for projects that meet the criteria of the plan. Garden View met all the requirements of the plan, addressing height, density and sustainability requirements; that, combined with the project team’s close collaboration with HRM throughout the design phase, saw the project receive site plan approval in less than 3 months. Preliminary construction costs for Garden View are estimated at just $120 per square foot (including the underground car park) but the project team is aiming to reduce these costs, so the total cost per square foot may come down further. Intended to deliver more than just affordable housing, Garden View’s design fosters community integration, with commercial units on the ground floor, senior-friendly enriched accommodation on floors 2 and 3, and family oriented units on the top three floors. The area has 618 residents currently, but the build-up potential could ultimately see at least 8250 residents in a progressive, sustainable, planned environment. Including Garden View, there are at least 5 buildings generated by this plan in various stages of development.